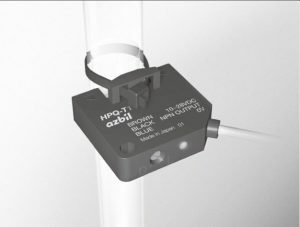 Model:HPQ-T*** Pipe Mounted Liquid Level Sensors with Self Contained Amplifier. These pipe-mounted liquid level sensors have a built-in amplifier allowing for simple, low cost installations with reliable detection. Models are available with LO/DO selection capability so the same model number can handle both upper and lower limit detection. Models with adjustable sensitivity and made for various pipe diameters are also available.